Dominic Wilcox. Not bad for a guy that never used clay before. Since man entered the Industrial Age and began creating machines, some people have risen up against the machines in hopes of proving that the machines cannot replace humans. Often the human challenger is victorious in the early lifecycle of a new machine, but it’s never long until a new, improved generation of the machine eventually wins. So here we are, in a time that will someday be viewed as the crude infancy of 3D printing. And, as we’ve seen throughout history, up steps a challenger to take on the 3D printer. 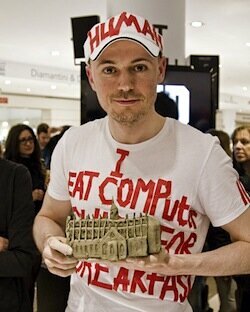 His name is Dominic Wilcox and he took on the Makerbot Replicator. The contest materialized after Wilcox announced to his friends on Twitter that he could beat a 3D printer. Turns out that the curator at the Milan Design Week (16-21 April 2012) event saw the tweet, and obliged Wilcox by setting up challenge: to see who can more quickly a copy of Milan’s Duomo Cathedral. Technically, Wilcox “won” the challenge. He put together his clay model in less time than the approximately 1.5 hours it takes a Replicator to build the model. Is Wilcox’s clay model really better than the 3D printed model? It’s bigger, but is it a more accurate copy? It really doesn’t matter, as all this was done in fun. He even showed up in a hooded white dressing gown, entering the ring to the sound of the Rocky theme music. Wefab.it, the team controlling the Makerbot, played along as well. They called their 3D printer Deep Pink, named after the famous Deep Blue computer by IBM that eventually beat Garry Kasparov at chess. But like Kasparov, it looks like Wilcox wants more. He’s setting up new matches already. Read his blog to keep up with him.